Considering Switching to Answers VBS? Your VBS cannot be beat. It has wonderful content. Other companies do not compare with Answers in Genesis VBS. Keep up the wonderful work!!! LOVE the solid, Biblical teaching. That's what has kept me continuing in the Answers VBS for all 11 years!! Keep it up!!! I really enjoyed the theme and content of the curriculum, our teachers loved it, my pastor was impressed with the content and this was his first VBS with us, it was a fun VBS all around. It's the best in so many ways. I am so thankful for your VBS material!!! I am more than pleased with Answers VBS! The curriculum, music, decorations, kit price, EVERYTHING. It is now our church’s favorite VBS curriculum! Thank you! Answers in Genesis VBS changed our kids ministry. We actually take the VBS curriculum and use it all school year long. We have a short amount of time each Friday night, so we stretch the lessons and activities out. The kids never get tired of it. Most of these kids come from poor, broken families…AIG has been a blessing from the Lord for our kids ministry and community. I highly recommend Answers VBS! The material is top quality & fun, but most importantly, it's rock-solid Biblical teaching & relevant to kids (& adults) in today's culture. I've never been so excited to volunteer in VBS as I was after getting this material to teach. You guys do a great job putting together the curriculum. Biblical teaching and content is the best there is and is why we've been using your materials since 2007 (7 C's of History that we made into our VBS lessons that year). Each year things keep getting better and better, we appreciate that. We also have loved having the dramas on the DVD as we can't do that ourselves and the kids love watching it in that video format. Thank you. Keep up the good work! I really got excited about using the Answers VBS at the camp I directed this summer. Knowing it was going to be solid Bible lessons which not only show God's word to be true and trustworthy, but also clearly show the love of God and his salvation for us. These kids needed more than pat answers, they need pointed to the reality of who God is and how he is involved in every part of life, not just at church. Thank you everyone at Answers in Genesis for coming up with and truly caring about what you're teaching! 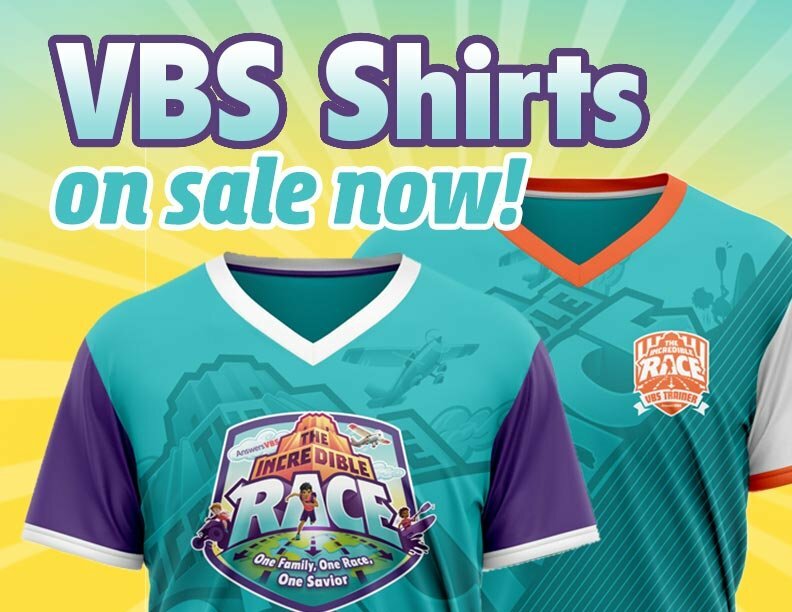 Answers VBS programs offer everything you’ve come to love in a VBS program: themed snacks, games, crafts, science experiments, a daily mission moment, and great music. Plus, these programs offer deep, rich Bible teaching and an emphasis on Scripture memory all bound up in a fun setting. Be sure to check out the samples from each leader guide in the order form. With all of these great testimonials and being able to check out all the samples, from leader guides, to crafts and games beforehand—what are you waiting for? Make the switch to Answers VBS and see how it transforms your summer program at AnswersVBS.com.